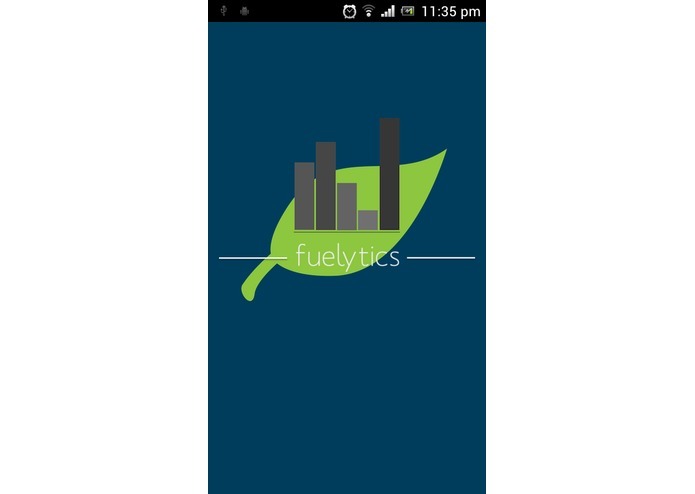 The Fuelytics app helps you visualize fuel consumption and other trip data in a seamless and innovative way in real-time. 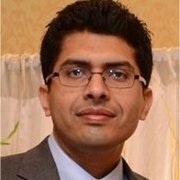 It provides analytics for drive patterns to encourage and challenge drivers to become more fuel-efficient. 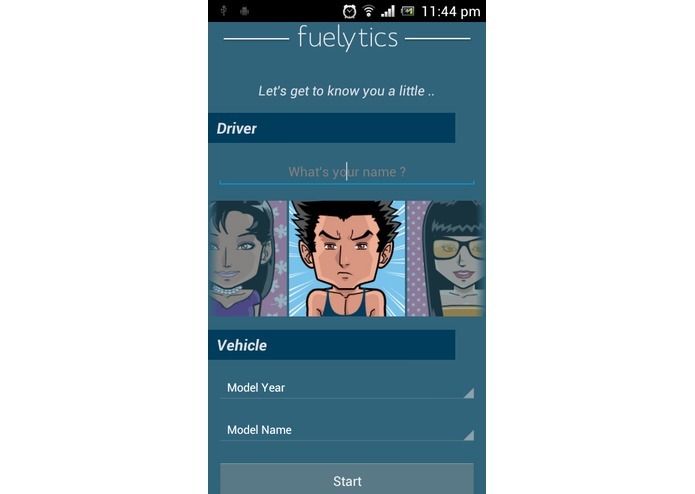 Fuelytics operates in two modes a) Drive mode b) Review mode. Fuelytics is intended to be paired via Bluetooth with OpenXC. It will auto-detect vehicle movement and lock the user interface in Drive Mode. Once in Drive mode, it starts showing real-time data about fuel efficiency as the vehicle accelerates or decelerate. It also projects other key data like speed, trip mileage, remaining fuel and fuel efficiency since the start of the trip on the screen. 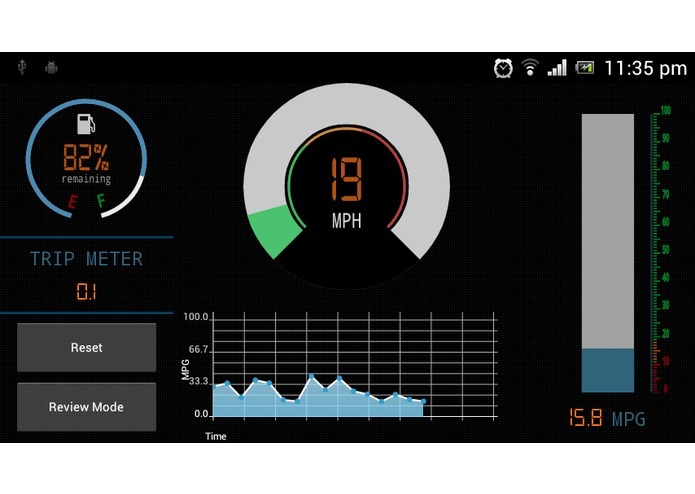 The data is presented in the shape of various gauges to be read at a glance, preventing our app from being a distraction to the driver. The Review mode becomes accessible only when the vehicle is stationary or the ignition is switched off. Once in Review mode the driver has access to a wealth of information. 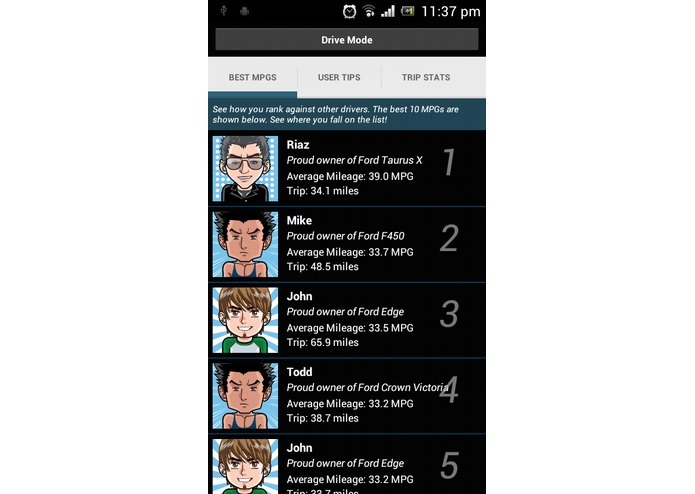 The “Leaderboard” section keeps track of the most fuel-efficient trips for the most miles driven recorded by all users of Fuelytics and will show the individual user how they rank against this list. 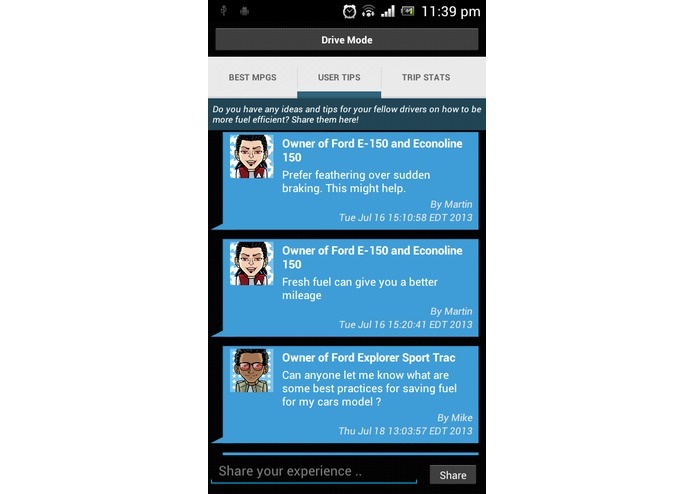 The “User Tips” section is a social platform to share fuel saving and efficiency enhancing tips with fellow users of the app. Finally the “Trip Stats” section provides detailed analytics about the last 50 drives completed by the user. It shows details like fuel-efficiency, fuel consumed, the number of times the brakes were applied, duration, distance traveled and the date. The user can even delve deeper and view the fuel efficiency and speed charts for each drive by simply clicking on one of the data sets.